We’d love your help. Let us know what’s wrong with this preview of Grace in Progress by J.C. Beichner. In this award-winning Christian devotional, author J. C. Beichner shares her own coming-of-age story of overwhelming childhood loss and her search for forgiveness. Combined with a beautiful collection of prayers, the author’s testimony and reflection help each of us discover the infinite depth of God's mercy. 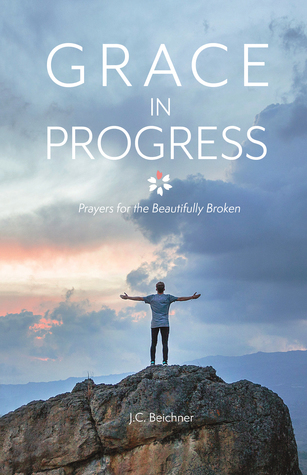 Grace in Progress: Prayers for the Beautifully Broken is an hone In this award-winning Christian devotional, author J. C. Beichner shares her own coming-of-age story of overwhelming childhood loss and her search for forgiveness. Combined with a beautiful collection of prayers, the author’s testimony and reflection help each of us discover the infinite depth of God's mercy. Grace in Progress: Prayers for the Beautifully Broken is an honest and timely reminder of the ever-present availability and abundance of Jesus's love, and the extraordinary ways God uses our brokenness for His purpose. The story of Grace in Progress and the devotional of prayers that follow will forever change the way you encounter your loving creator. To ask other readers questions about Grace in Progress, please sign up. My wife and I used this handy book of 21 touching prayers as part of evening devotions. Readers will find personal application to many of the petitions and expressions of adoration for the Lord. The prayers are humble, authentic, and heartfelt. Beichner shares a sincere and courageous personal testimony in the book’s foreword and brings a healthy, refreshing, and well-developed Christian perspective to the prayers she presents to her readers, one that acknowledges our standing before The Almighty My wife and I used this handy book of 21 touching prayers as part of evening devotions. Readers will find personal application to many of the petitions and expressions of adoration for the Lord. The prayers are humble, authentic, and heartfelt. Beichner shares a sincere and courageous personal testimony in the book’s foreword and brings a healthy, refreshing, and well-developed Christian perspective to the prayers she presents to her readers, one that acknowledges our standing before The Almighty and our need to grow in faith. Some sentences here and there could be improved grammatically, but they do not significantly detract from the book’s important content. Readers will receive fair value here. J.C. Beichner ~ thank you!